A memorable dinner party or holiday meal starts with delicious food and great company—but is incomplete without a dressed up dining room. Creating an inviting, warm dining experience in your home is simple when you have the right accessories. Dining table décor is an affordable way to create an atmosphere for your guests as soon as they step into your home. There are many beautiful decorations to mix and match to develop a style. Choosing the backdrop of your table will make the rest of your dining room décor effortless. Once you have the perfect tablecloth for your dining room, you can get really creative! 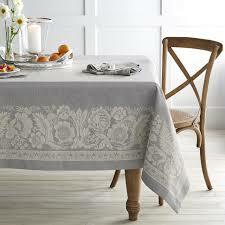 The right tablecloth sets the tone you desire for your dining room. Are you looking for simple and elegant or fun and festive? Do you prefer a pattern or solid color? We feature a number of selections to suit any occasion and style. It’s small touches like these that create warm memories for you and your guests. Some combinations are always in style. Like the classic pairing of blue and white. The Mandarin Lapis tablecloth brings those colors together to create a sophisticated and chic Asian-inspired style that’s lovely for coffee-infused breakfasts or an elegant dinner with friends. Blue and orange are complementary colors; so consider using a clementine vase or plates to add an unexpected splash of color.